Interstate 283 serves the capital city of Pennsylvania from the southeast with connections from I-76 (Pennsylvania Turnpike) and the PA 283 freeway inbound from Lancaster. I-283 parallels Eisenhower Boulevard along a commercial strip through Lower Swatara and Swatara Townships. The north end is the Eisenhower Interchange, a multi level exchange with I-83 (Capital Beltway) and U.S. 322 west from Hummelstown. 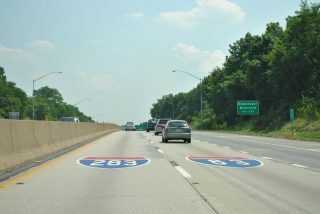 Painted shields were added to the Interstate 83 mainline southbound ahead of I-283 in an effort to aid motorists at the forthcoming Eisenhower Interchange. Photo taken 06/21/12. Heading north into Swatara Township on Interstate 283, 1.5 miles from the Eisenhower Interchange with I-83 and U.S. 322. Photo taken 06/24/12. A diamond interchange (Exit 2) joins I-283 with PA 441 (Lindle Road) at Swatara. Ramps for I-83 south and U.S. 322 depart within one mile. Photo taken 06/24/12. Single lane ramps separate from I-283 northbound for Interstate 83 (Harrisburg Beltway) southbound to Paxtang, Downtown Harrisburg and the State Capitol complex and U.S. 322 eastbound to Hummelstown and Hershey. The Eisenhower Interchange Photo taken 06/24/12. The I-83 Capital Beltway Project will eventually reconstruct the substandard Eisenhower Interchange. Included in I-83 East Shore Section 2, future work will remove the turn off to stay on (TOTSO) movements along the Interstate 83 mainline and redesign all ramps with I-283 and U.S. 322. Photo taken 06/24/12. Exit 3B leads directly onto I-83 north & U.S. 322 west to Interstate 81 north for Hazleton and U.S. 22/322 northwest to Lewistown. Photo taken 06/24/12. Interstate 83 continues east from Harrisburg along side Paxton Street to the Eisenhower Interchange (Exit 46) with I-283 south and U.S. 322 east. U.S. 322 west overlaps with the remaining miles of I-83 north to I-81.Photo taken 06/21/12. U.S. 322 extends east from Eisenhower Boulevard and I-83/283 as an expressway to Rutherford. I-283 links I-83 (Harrisburg Beltway) south with PA 283, a 29 mile long freeway from Highspire to Lancaster, and the Pennsylvania Turnpike at the Harrisburg East Interchange. Photo taken by Tim Reichard (08/19/02). Previous guide signs for Exit 46A referenced Interstate 283 south without MDT Airport and Lancaster. Photo taken by Tim Reichard (08/19/02). U.S. 322 splits from I-83 southbound for Eisenhower Boulevard ahead of an exchange with Derry Street. Interstate 83 arcs east from the seperation at Exit 47 to a left side ramp for I-283. Photo taken by Tim Reichard (08/19/02). Interstate 83 makes a TOTSO movement west from I-283 and the Eisenhower Interchange into the city of Harrisburg. A single lane ramp connects with Interstate 283 south at Exit 46A. Photo taken by Tim Reichard (08/19/02). U.S. 322 enters the Eisenhower Interchange south of Lawnton. The ensuing ramp joins Interstate 283 south toward Harrisburg International Airport (MDT). Photo taken by Tim Reichard (08/19/02). The multi level interchange joining U.S. 322 with I-283 south and Interstate 83 (Harrisburg Beltway) was constructed in the 1960s. Photo taken by Tim Reichard (08/19/02). Interstate 283 advances south across Laurel Run to the cloverleaf interchange with PA 283 at Highspire. The mainline concludes just beyond PA 283 at the toll plaza for the Pennsylvania Turnpike. Photo taken 06/21/12. Pennsylvania 283 originates just west of Exit 1B at Eisenhower Boulevard outside the borough of Highspire. The freeway extends east around Middletown and Harrisburg International Airport (MDT) to U.S. 30 at Lancaster. Photo taken 06/21/12. An end shield stands within the median of I-283 ahead of the PA 283 overpass and trumpet interchange with I-76 west to Pittsburgh and east to Philadelphia. Photo taken 06/21/12. Two miles ahead of the Harrisburg East Interchange (Exit 247) with Interstate 283 north on westbound Interstate 76 (Pennsylvania Turnpike). Photo taken 10/15/04. Interstate 76 runs between the borough of Highspire and the Greenwood Hills community west to the trumpet interchange (Exit 247) with Interstate 283 north. Pennsylvania 283 parallels nearby through Lower Swatara Township. Photo taken 10/15/04. Exit 247 leaves Interstate 76 west for I-283 north to PA 283 east to Harrisburg International Airport (MDT), I-83 (Harrisburg Beltway) and U.S. 322 east to Hershey. Photo taken 10/15/04. Interstate 76 (Pennsylvania Turnpike) makes a sweeping curve ahead of the Susquehanna River and Interstate 283 (Exit 247). Photo taken by Chris and Amber Lokken (06/24/08). Photo taken by Chris and Amber Lokken (06/24/08). The Susquehanna River bridge spans AMTRAK, two other railroad lines and PA 230 (Front Street) just ahead of Exit 247 for Interstate 283 north. Photo taken by Chris and Amber Lokken (06/24/08). Two lanes separate from I-76 east at the Eisenhower Boulevard underpass for Interstate 283 north to Harrisburg and adjacent Pennsylvania 283 east to MDT Airport and Lancaster County. Photo taken by Chris and Amber Lokken (06/24/08).